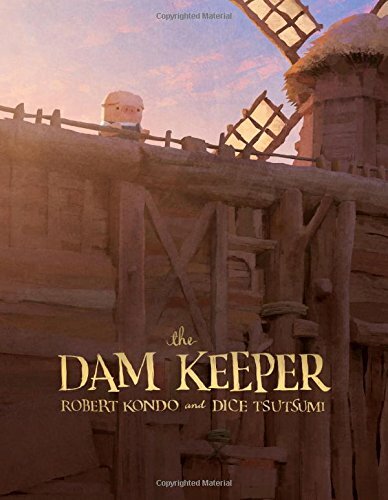 Robert Kondo and Dice Tsutsumi’s graphic novel The Dam Keeper is a spinoff from their award winning short film by the same name. The graphic novel is published by First Second and comes with a beautiful textured book jacket and in hardcover. For those who are not familiar with the short film, the story is about Pig who lives in a windmill and spends his time keeping it spinning to repel the dark fog from engulfing the town. Pig is socially awkward and often gets bullied in school despite his efforts at keeping the town safe. There’s also Fox, a new student who becomes his best friend. For this graphic novel, the story follows a similar premise, but with more details being fleshed out through the pages and expands on Pig’s and his friends adventures. The book achieves a similar aesthetic feel to the short film, in terms of the color palette and painterly feel. Each page is gorgeously illustrated by the 2 artists with muted tones. The anthropomorphic characters of Pig, Fox and other characters are beautifully conceptualised and designed. Perhaps that’s why besides the graphic novel, the IP is branching out to an animated television series too. The book seems to be targeting at the younger readers as the storytelling is pretty straightforward and the page ends with a cliffhanger. To find out what happens, readers will have to wait till July 2018 for the publication of the 2nd book titled The Dam Keeper: World Without Darkness. Sorry that no pictures are included. I forgot to take the photos before returning the book. You can check out the art from The Art of The Dam Keeper instead.